Citing a $2 million tax assistance agreement with the developers of the Costco Wholesale store on Hartford Road, endorsed Democratic Mayoral candidate John McNamara called on the Stewart administration to ensure that construction jobs at the building site be reserved for Connecticut construction workers and that construction on the site be in full compliance with Connecticut labor law. 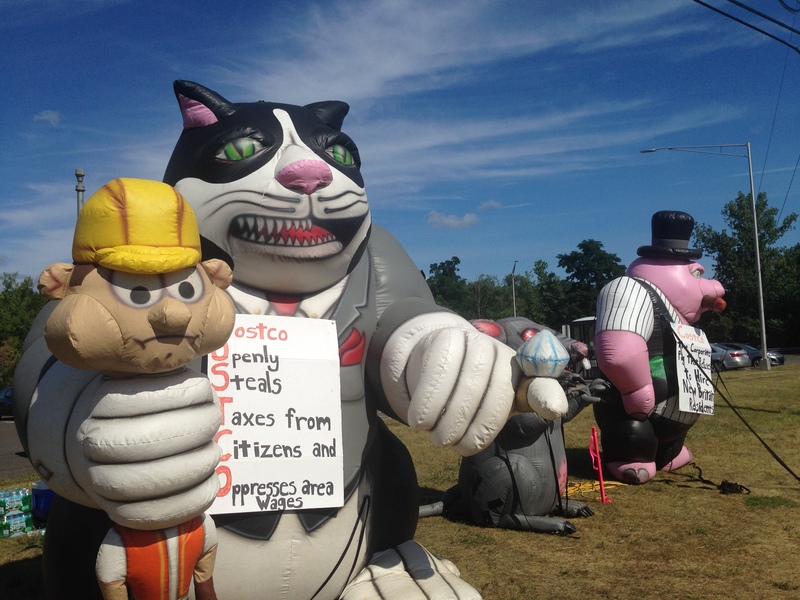 “New Britain taxpayer assistance is subsidizing dozens of out-of-state workers in often unsafe circumstances, while Connecticut trades laborers are left out,” said McNamara in the wake of action by the Connecticut Department of Labor and ongoing trade union protests at the site. Recently the Department of Labor (DOL) issued a stop work order at Costco because one of the prime contractors failed to provide required Workers Compensation Insurance coverage for its non-union employees. Other employees were being denied salary protections required by Connecticut law. The Iron Workers Union and other trade unions are protesting the use of low-cost, poorly trained out-of-state workers who are on the job in unsafe conditions at the site. Local iron workers’ protest near Costco store construction site. Despite a $2 million property tax break the Stewart administration failed to push for fair wages and local job opportunities. In an open letter, David Roche, President of the CT State Building and Construction Trades said that he has sat outside the Costco site with out of work residents and watched out-of-state workers drive onto the site and take dollars that should have been earned by members of local communities. Roche said “… local elected officials failed to demand the residents of their communities be hired during construction…” – something that should have been done in view of the tax abatements benefiting these companies. In August 2014, assurances were made by a representative of Northwest Atlantic, the real estate consultant for Costco, that fair wages would be part of the project when an 11th hour, $2 million abatement was rushed through at a special meeting of the City Council. This entry was posted in Costco, Labor rights, Minimum and Living Wages. Bookmark the permalink.